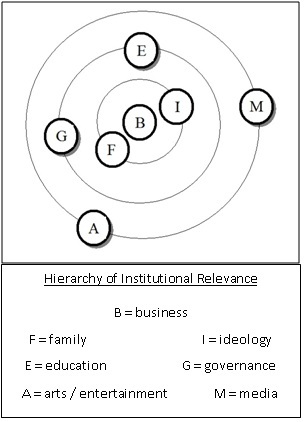 This attempt to review the “seven mountains” of culture is, hopefully, to demonstrate to some extent the degree of relevance of each of the meta-institutions in human experience, establishing a hierarchy of influence (or perhaps at least explicate the varying depths of relative or necessary integration of each institution into individual experience and cultural development). Some have suggested a comparison of the seven mountains to Maslow’s Hierarchy of Needs but there is significant difference between individual experience and the overarching experiences of cultural groups and diverse societies. While institutions tend to operate at the macro- level, trying to discuss them from an individual’s perspective would be somewhat analogous to the conversational disconnect between an economist concerned with trends in international trade and a factory worker or farmer contemplating how to pay for auto insurance. There may be relevant connections between them but too much distance to converse coherently across the concerns and terminology of completely different perspectives. The “seven mountains” is a paradigm originally put forth by a group of evangelical Christians in a campaign to compel adherents to carefully consider how they might influence these realms of human experience toward a godly society, at least according to a widely acceptable Christian worldview. I have made one slight adjustment from the original list of seven institutions, re-labeling religion as ideology in recognition that some compelling philosophies are not religious per se, such as secular humanism or Buddhism, in the sense they do not necessarily recognize a particular god or groups of gods as distinct influences on human behavior. My listing of these core cultural institutions includes business, family, ideology, governance, education, arts / entertainment, and media. This study is an attempt to establish a hierarchy of relevance while recognizing that all these institutions have significant connections to all people but that those connections also vary widely by degrees in individual lives. I created the diagram below to illuminate the hierarchy I have assigned to the seven institutions of culture. I will attempt to justify the positioning of each institution, working from the outside and moving inwardly. My thesis is that business (specifically, the fruit of production and the increase, or productive gains, which manifests in cooperative and collaborative trade) holds the highest relevance of all the institutions in human experience, perhaps not emotively or spiritually, but practically. However, since practicality is the gears, belts, and fuel by which we live, so to speak, the engine of staying alive, then we must reconcile all these meta-institutions to their role as related to the full nature of being human, that is, in mind, body, and soul. The outer ring includes media and arts / entertainment. These are important institutions as they are the mechanisms for large-group (at the societal level) communications and self-expression. They are the means by which we give and receive news, oftentimes give and receive instruction, and how we artistically share with one another expressions of values whether visually, audibly, textually, or any combination of all three. These tend to be more integrated into individual experience in the most economically developed societies as the various means of mass electronic communication – television, radio, telephone, Internet – are there most widely available. The depth of integration of these with the other pillars is easily seen when we think about the news media bringing information about governmental policy issues, public television distributing educational programming to a broad population base, families and friends connecting and communicating through social media, and so on, and how arts / entertainment, as an expressive outlet, lets us examine psychological and emotive responses to social and political conditions. As said, the media and arts / entertainment functions play a high role in developed and complex societies. They may play a lesser role, at least as meta-institutions, in developing economies and especially amongst those in abject poverty or living under authoritarian regimes or ideological constraints where available news and artistic expression are limited to highly censored news, minimal Internet access, or socially normalized moral codes. Both the media and other mechanisms of arts / entertainment contribute enormously to social, economic, political, and even environmental viability, and can inform and facilitate very important cultural needs like cross-cultural awareness, integration, and tolerance. The next tier, moving inward, includes education and governance. If we can use an analogy of a fish tank to represent a particular cultural context, governance goes a long way to creating a “field of containment,” the tank itself, as an environment conducive to varying degrees of expression and communication and economic development. It also contributes substantially to the shared mindset of social complexity, tolerance, opportunity, etc. Legal institutions may or may not protect and encourage personal safety and well-being, prosperity, and the orderliness of the society. Typically one would expect governance to embrace the collective social view in free societies and the elite social view in authoritarian societies, i.e., it expresses the view of the over arching power structure of the society and the interests of those in control, whether that power is closely held or broadly distributed among the masses. One expects to find varying restrictions on the general population under monarchical or oligarchic regimes as the governors tend to serve their own welfare, or as benevolent leaders in such systems produce social and economic conditions quite the opposite. Where power is widely decentralized (specifically in democratic societies) one expects to find greater degrees of personal freedom and opportunities for self-actualization, as citizens work within frameworks of complex legal structures created through representative governance to establish orderly markets and social institutions. Resorting again to the fish tank analogy, education is likely the oxygen component of the water filling the tank. I will revisit the hydrogen below. It is widely held that education is the fastest track out of poverty. The abilities to obtain, retain, and manipulate data and ideas is inherent in all people. Often, in the environs of the least access to formalized education, these abilities are actuated through peer experience and trial and error (in effect an informal practice of the scientific method posing hypotheses based on prior observation, experimenting, and then synthesizing new observations with other experience). Education serves a multitude of purposes on a personal and cultural level and, like governmental structures, can make enormous contributions to social well-being, and economic and political development, and, like media and arts / entertainment, can inform and facilitate cross-cultural awareness, integration and tolerance. Access to education — primary, secondary, collegiate, and post-graduate — varies dramatically according to levels and complexities of economic development. Highly industrialized nations host public and private educational institutions at all four levels. Obviously the diversity of what is available has a high degree of correspondence to the diversity and strength of the surrounding economy, hence large economies typically will host more institutions affording broader opportunities for specialization than smaller, though as economically viable, economies. Education tends to function with a snowball effect. Through time, as students graduate from one level to the next, their inputs into their economic context increase the overall value of that context which in turn can afford to birth greater educational opportunities and so on and so on in an upward cycle. Education also plays a large role in worldview as students are exposed to the world of ideas, foreign cultures, new technical disciplines, new friends, or educators with varied life experiences, ideologies, and knowledge. Often higher education is very formative of younger students who are moving for the first time away from the environs of family and the religious or philosophical institutions of the family. However, as children are highly formed socially at a very young age and tend to stay closely connected to their families and cultures of origin, it is not likely to prove as influential as the institutions in the next inward tier of the diagram. Thus far we have delved into the cultural pillars of media, arts / entertainment, governance, and education. History proves that these are long-standing institutions that have evolved toward higher degrees of complexity through time. The forerunners of our modern conceptions of media and arts / entertainment in societies without written language or electronic gadgetry would have taken place in activities like social and religious ritual, storytelling, music, pageantry and such. Governance of isolated tribes may have consisted in hierarchies similar to family structures today with villages operating as autonomous economic units under the auspices of a strong man ruler or a council of elders. Education in agrarian or hunter-gatherer cultures would have been largely through intergenerational and peer teaching and experience sharing. That said, these institutions have been vital cultural components of human history for organizing interdependent and / or interactive social groups. But they still function peripherally, to a degree, by comparison to the vitality of the remaining three institutions: family, ideology, and business. Nomadic tribes survived with informal (largely undocumented or absent complex structures) methodologies in these first four institutions for thousands of years before the invention of written language (though hieroglyphs, especially cave drawings, as conceptual expression through symbology certainly support the notion of very early starting points), the invention of governing documents of covenants and creeds, and formal education for training. The third inward tier includes family and ideology. These are highly formational and central institutions given the importance of nurture of the young in both physical and social well-being and the relationships between the family structure and the other institutions of the surrounding culture. Family and core philosophies, mythologies and religions, learned most often inter-generationally, form the basis of one’s relationship to the reality outside one’s self, and of the concept of conscious life itself. In the fish tank analogy, I would tend to equate ideological development and retention to the hydrogen in the water as it largely informs self-concept…who or what am I in the context of reality…a defining function in social development and involvement. From such philosophic beginnings and coupled with both individual and, more predominantly, group experience, ideology helps frame value systems and morality. Behaviors are chosen and their acceptability within society learned through the varying direction or responses by other actors. The foundations of functional ideology are laid in the normal operation of the family during early childhood development. Hence the family and its core philosophies, and then the dominating ideologies of the surrounding culture, help lead the child into social cohesion where functional place, the individual’s roles in trade, politics, and the other communal institutions, can be discovered and entered into. Attitudes on display and learned in the family, and early ideological exposures define the relationship one has with the self, with others, with nature, and with the divine. These are powerful influences and notions that have lifelong meaning, whether they are accepted or rejected. The family is also the first level of socialization, the foundational step in the path to self-actualization. In effect, our families and our ideologies define who we are and our responses, whether emotional, rational, or a combination of both, to life events. Finally: it may seem odd to think that business is at the very heart of human institutions but, coincidental with Maslow’s Hierarchy of Needs, business, as the provider of basic human physical needs, is an issue of survival, proliferation, and physical well-being. Where the other institutions are influential in informing attitudes, choices, and actions, which can vary widely in application, sustenance is fundamental to staying alive. The provision of sustenance (water and food) and physical protection (warmth, shelter, sleep) are largely made available and sought in market mechanisms and participation. This is a reality of being social animals working cooperatively and collaboratively to increase well-being, raising the standards of the quality of life. It is through the basic economic mechanisms of the division of labor, specialization, collaboration, and exchange that we typically meet the most fundamental of our needs (other than air) for survival. This points to the marketplace primarily as a realm of essential social cohesion – relationship valued for advantageous communal survival and proliferation – before it becomes the place for individual financial gain. It is through amicable, cooperative social cohesion that we best facilitate the most desirable states of life: peace and prosperity, in effect, shalom. Market exchanges facilitate increased efficiency in providing the fundamental necessities of life, creating new wealth and the opportunity to formalize all the other meta-institutions. Business “pays for” family (household provision), supports the priesthoods of ideology, funds the workings of governance, makes formal education available, creates the cultural leisure necessary to advance the arts and entertainment, and drives the technological development of ever-broadening means and reach of communication. Our exchanges underwrite all that is good in human society, even while tolerating coercion, greed, and self-aggrandizement. The centrality of business has largely been neglected in the sense of its foundational function in human experience, especially in most mainstream ideological doctrines and expressions. To understand the role of business as central to the human social contract, its potential for deepening social cohesion (peace), and its ability to provide sufficiently for the entire human family (prosperity) would prove a commendable pursuit in the theory and practices of all the other core institutions. I believe, though it is generally unspoken, the well-being of the whole community (the common good) has been the compelling force of the market throughout history, before personal financial gain, which has taken stronger hold with the increased autonomy and egocentrism motivated by the ideologies and psychological impacts of Western individualism and capitalism. The economic interdependence of individuals and nations (community), given the abundance of global wealth and growing awareness of disparities of economic stability, is now motivating much of the rising current of social venture mentality and initiatives. Business has always been a force for good almost in spite of human involvement toward self-interest. In fact, the highest levels of self-interest can only be achieved in the mutual interest of market participation. Copyright David B. Doty, 2012. Will – I ALWAYS look forward to your responses. As to the fluidity, the integration of these spheres is enormously permeable as I think you capture in taking the fish tank as a whole. The attribution of the marketplace to the Creator is absolutely the central thesis of Eden’s Bridge so you obviously take that away from my intention as well. Concerning the whole model through time I think I believe some form of each of these institutions, however informal, have pretty much been present from the beginning. As for the future, I am especially intrigued by the historic progression toward higher complexity. If culture and its institutions have gotten to where they are today as a grace gift of God toward helping us manage such an enormous world population (though we fall very short of yet doing it as well as we might hope for), what does that trajectory look like in two hundred or even two thousand more years? I hope that answers your questions. It is an off-the-top-of-my-head response to your questions. You always ask me for more, to press my meaning more deeply, and I really appreciate that. David, I really found your reasoning interesting. The Maslow rationalle for placing Business as the central “institution” and “force for good” was expecially interesting. My difficult with the Maslow approach is that it is based on a premise that basic needs are the ultimate drivers. But when we evaluate something as good, we informally suggest that a higher moral basis takes precedence. The market place reflects as a consequence more than it drives as a guide – more of a tail than a head. i can see the marketplace as a socialogically shaping consequence more than a guiding institution. Thanks for your thoughtfulness. Dan – Thanks for your comments. One of the reasons I guess I see the marketplace as a driver would be that it is by work, and by extension trade, that we sustain ourselves so the marketplace is fundamentally a biological as well as a moral enterprise (once we cross into the arena of exchanges). I should probably work that into the next iteration. Thanks, again. Very helpful comments.